With Readly you can read Classic Rock Annual and thousands of other magazines on your tablet and smartphone. Get access to all with just one subscription. New releases and back issues – all included. 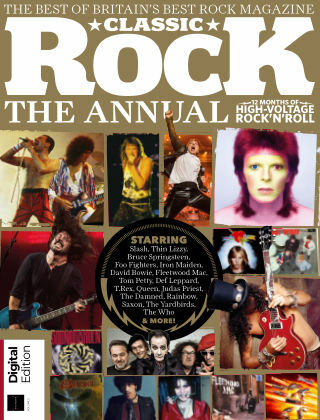 "This compendium is stuffed full of interviews and articles published in Classic Rock magazine over the past 12 months and features some of the biggest names in high-voltage rock’n’roll. We venture behind the scenes of classic albums by David Bowie, Thin Lizzy, T.Rex, Saxon and The Wildhearts; talk careers, new albums and more with Slash, The Damned, Iron Maiden, Queen, Foo Fighters, Judas Priest, Scorpions and Queens Of The Stone Age; remember the life and times of the late, great Tom Petty and The Who’s John Entwistle; take a deep dive into the worlds of Wishbone Ash, Fleetwood Mac, Soundgarden, Girlschool, The Yardbirds, Def Leppard, Bruce Springsteen, Joan Jett and so much more! "